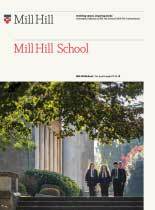 At Mill Hill, Chemistry, like all the sciences, is taught as a separate subject from the Fourth Form by experienced subject specialists. Chemistry is taught almost exclusively in specialist laboratories, a practice which allows continued emphasis on the practical nature of the subject through teacher demonstrations and, predominantly, through the medium of class practical work. The department is housed in a suite of three purpose built laboratories and one lecture style laboratory. The department offers many workshops, challenges and Olympiads. We follow the AQA Chemistry specification which is one of a suite of three science specifications used by the Science Department at Mill Hill. The course develops an increasingly sophisticated theoretical understanding of the subject while continuing to emphasise the practical basis of the subject and its vital contribution to contemporary society. Chemistry is a popular choice at A Level, with a large proportion of pupils going on to study Chemistry and Chemistry related courses at Oxbridge and Russell Group Universities. Mill Hill follows the Edexcel syllabus which is traditional in style and which offers ample opportunity for experimental work above what is required in core practicals. The course is structured as a two year linear course that extends and develops the ideas encountered in GCSE Chemistry. Chemistry at Advanced A Level is a prerequisite for many courses at university and for many areas of employment. It is also a long-established and respected qualification that allows progression into a number of subjects at university that include Natural Sciences, Medicine, Veterinary Science, Agriculture, Biosciences, Pharmacology, Chemical Engineering, Materials Sciences as well as Chemistry. Chemistry graduates enter many disciplines and a degree in Chemistry is a qualification that is highly regarded in today’s world: technically adept individuals, problem solvers, numerate individuals and those that can deal with complex and challenging ideas remain essential to our rapidly developing society.